View of arched gateway into the Taragarh Fort, Ajmer. bl.uk > Online Gallery Home	> Online exhibitions	> Asia, Pacific and Africa Collections	> View of arched gateway into the Taragarh Fort, Ajmer. 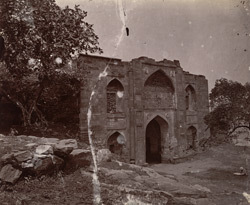 Photograph of the gateway into the Taragarh Fort, Ajmer, taken by O.S.Baudesson in the 1880s, from the Archaeological Survey of India Collections. The Fort at Ajmer is believed to have been built by Ajairaj in the early 12th century, when the city became the capital of the Chauhan Rajputs. It was sacked by Muhammad Ghuri in 1193 and later fell to the rulers of Mewar followed by the rulers of Malwa before it was annexed by the Muhgal Emperor Akbar (r.1556-1605) in 1556. The Fort is situated on top of the Taragarh hill which rises 870 metres above the sea level. It is a rectangular fortress with large corner bastions and thick walls. This photograph is printed from a broken glass plate.